Keynote address by Pace University professors Dr. Emily Welty and Dr. Matthew Bolton, at the Parliament of the World’s Religions in Toronto, 6 November 2018, about their advocacy with the Nobel Peace Prize-winning International Campaign to Abolish Nuclear Weapons. 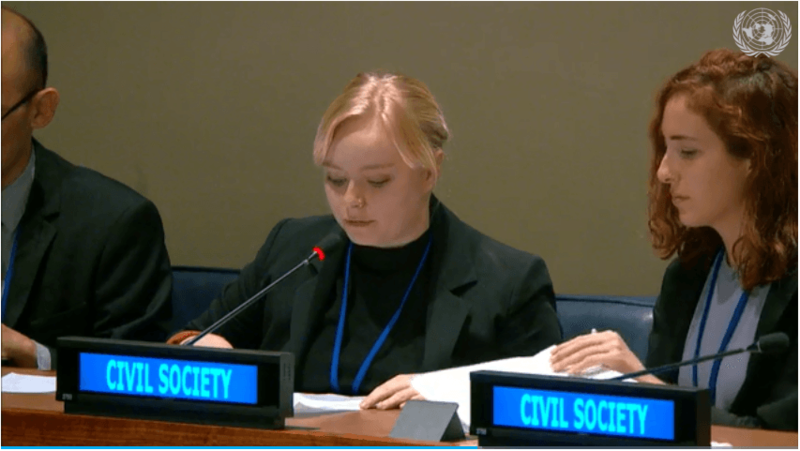 Pace students Sydney Korman and Terrie Soule delivered a statement in October 2018 to the United Nations General Assembly First Committee (Disarmament and International Security) on calling for greater participation of youth, women, survivors of violence and people from the Global South. Nuclear weapons use, testing, development and production have caused multi-generational human harm and persistent environmental damage that pose a threat to sustainable development, says Dr. Matthew Bolton in an interview with Friedrich Ebert Stiftung’s New York Office. Pace University professors Dr. Emily Welty and Dr. Matthew Bolton, a married couple, speak about their commitment to advocacy and activism to make the world a more just and peaceful place. In an interview with Radio New Zealand, Dr. Matthew Bolton argues that the 2017 Treaty on the Prohibition of Nuclear Weapons offers an new normative framework enabling assistance to victims and remediation of contaminated environments in the Pacific region through international cooperation and assistance. Dr. Matthew Bolton interviewed by WAMC Northeast Public Radio on the Iran Nuclear Deal.